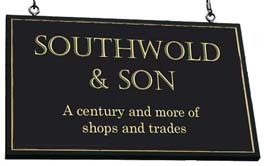 James Fryett - deputes the management of this branch to his nephew, William Blowers. 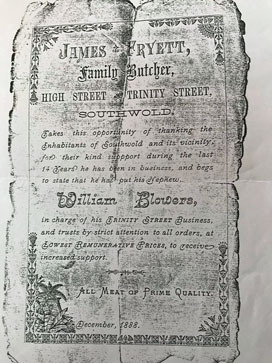 Henry James Fryett - Butcher (K1924).Henry James is a son of John and Edith Fryett who have been running the butcher's shop round the corner at No 32 East Street. He is the grandson of the previous owner, James Fryett. F S Inwood & Son - Outfitter closes in the early 1940s. 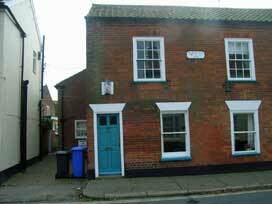 Clarke - The premises is reopened as a tea room but closes the following year when the owners move their teashop to No 34 East Street. 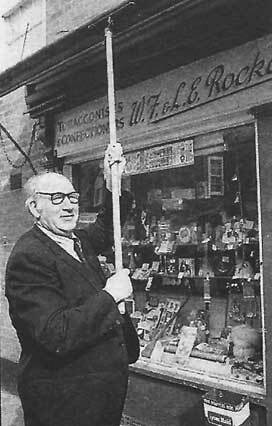 Walter F and L E Rockall - Tobacconist, Confectioner and Fancy Goods..
1888 advertisement announcing that James Fryett's Trinity Street branch was to be managed by his nephew William Blowers. 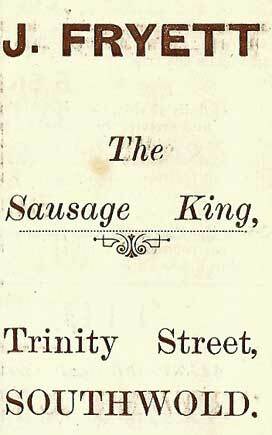 1929 advertisement in Southwold Wesleyan Church Guide. With thanks to Gary Doy for supplying the picture.